Cranberry juice does contain vitamin C. However, the amount will vary based on the type and brand of cranberry juice you drink. Just because a cranberry juice is labeled "100 percent juice" does not mean it is 100 percent cranberry juice. Because of this, vitamin C content may vary based on brand and the juices they use. For example, Ocean Spray 100 Percent Juice Cranberry contains cranberry juice, grape juice, apple juice, pear juice, flavorings, and added ascorbic acid (vitamin C). Because of the added vitamin C, it does contain 100 percent of the recommended daily intake of vitamin C for an eight-ounce serving. Ocean Spray pure cranberry juice contains only cranberry juice concentrate and water with no added ascorbic acid. According to Ocean Spray's nutrition information, it does not contain any vitamin C.
Alternatively, while RW Knudsen Cranberry Juice, which is a juice concentrate that needs to be mixed with water, contains 100 percent cranberry juice without other juices mixed in, it also doesn't add vitamin C. Without the added ascorbic acid, it only contains eight percent of the daily value for vitamin C for a two-ounce serving combined with six ounces of water, which is significantly less than juices with ascorbic acid added. Simple Truth cranberry juice contains water, cranberry juice, and cranberry concentrate without any listed added ascorbic acid. An eight-ounce serving contains 40 percent of the daily value of vitamin C.
Cranberry cocktail is not 100 percent juice. Instead, it has sugar added to sweeten it. However, it does also have added vitamin C. Ocean Spray cranberry juice cocktail contains 100 percent of the daily value for vitamin C in an eight-ounce serving, but it is also high in added sugar. 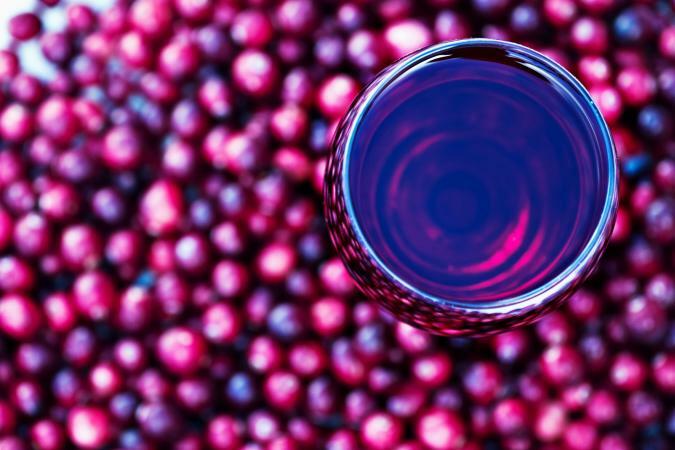 According the manufacturers' nutrition and ingredient information, cranberry juice may have very little vitamin C, or it may be fortified so it contains 100 percent of the recommended daily value in a single serving. However, cranberries themselves do have vitamin C with about 18 percent of the recommended daily value in a cup of cranberries, so it stands to reason that if cranberry juice contains actual cranberries, it will, indeed, have some vitamin C.